I sort of wish I could nudge my nesting urges toward cleaning out the pantry or dusting and vacuuming but all I really want to do is sew baby-related things. Some of these things are for Isaiah. 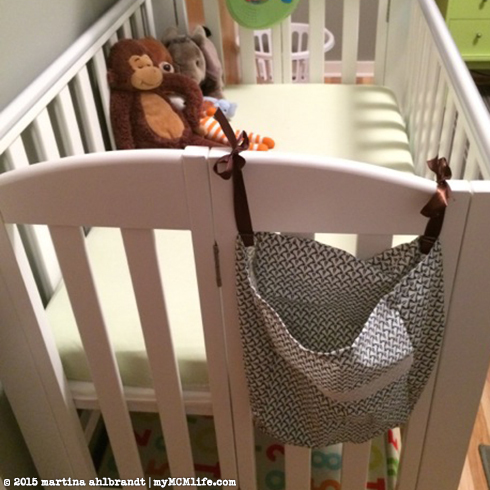 (I wrote about the paci clips, storage bag for the crib, door latch silencer here.) I’ve also been making lots of things that I intend to sell and/or give as gifts to friends. I’ve made a bunch of jersey knit nursing scarves (and haven’t photographed any yet). I’ve made 7 bandana bibs and have several more in the works. These pictured are small/newborn size. I’ve made two pairs of suspenders and have supplies for several more in various colors. I’m working on some prototypes for outfit sets (pants, hat, mittens/socks) for newborns made from recycled 100% cotton jersey. Here’s my first set. I made two hats because I’ll probably make a few matching sets and a few mixed pattern/color coordinating sets. In the coming months I’ll be getting high quality photos done of these projects with models (for scale) and then they’ll be up for sale in my Etsy shop. I figure it will help to fund the unpaid time of work for my maternity leave. My job, like many, doesn’t offer any paid time off. I can take up to 12 weeks off with the FMLA but I have to use up all of my vacation and sick time first and it’s unpaid. Yaaaaayyy… Back to sewing I go! I’m open to suggestions and requests if you have any ideas or if you’d be interested in purchasing something in the next few months. 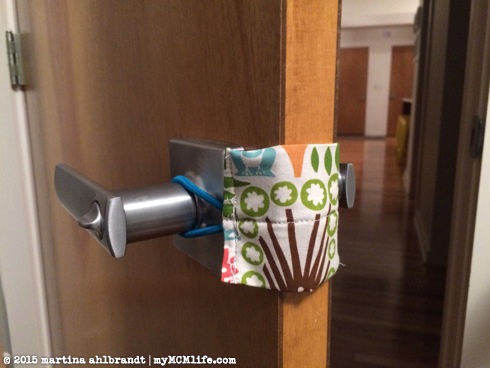 I recall several people mentioning the door latch silencer. I’ll put it on my list to make more. 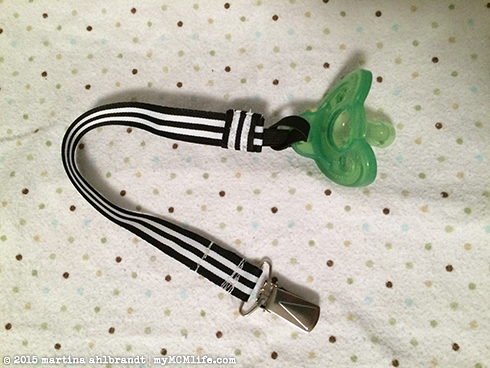 I bought these mitten clasps last summer when we had little Firefly but I never got around to making him a pacifier strap before he left. This was very simple to make. I cut a strip of cotton fabric, folded it in half with right sides together, pressed open a seam allowance on one end, sewed the sides together and cut off the scrap close to my seam. The only difficult part was turning the little thing right side out. Once I did that, I pressed it flat with an iron. I sewed a small piece of elastic into the open end, closing it off. I folded and pressed the other end of the strap and sewed in around the mitten clasp. Since it was such a pain to turn the strap right side out, I decided to make a second one using ribbon left over from the suspenders of his coming home outfit. This one was even faster but I think it would have been better with wider ribbon. I could have made a simply bag but I happened to have this cotton pouch saved from a recent purchase of a queen sheet set. 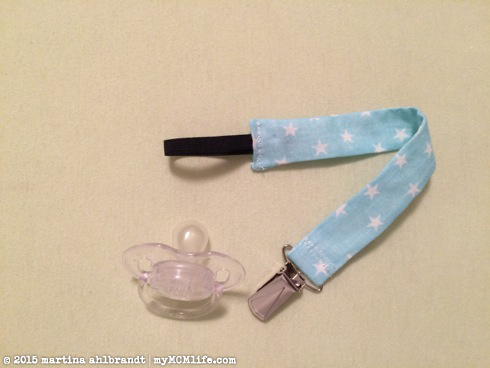 It’s a bit bigger than needed for pacifiers and paci clips but that’s fine. All I did was make two equal lengths of brown ribbon and sewed it onto each side of the bag. Pacifiers will be easy to locate at rest times and when baby boy is bigger, he can reach into the bag himself if he needs one at night time. I used hair elastics like the inspiration link above but I found them very difficult to sew through. Next time I think I’ll just use elastic. In my excited anticipation of Baby Boy’s arrival in April I decided to start putting together an outfit for him to wear home from the hospital. I bought some black-and-white striped ribbon and sewed it onto a white onesie with faint blue stars to look like suspenders. I paired it with gray paints, no-scratch mittens and a hat that I made last summer for Firefly. I also made the bow tie for Firefly for a photo shoot. 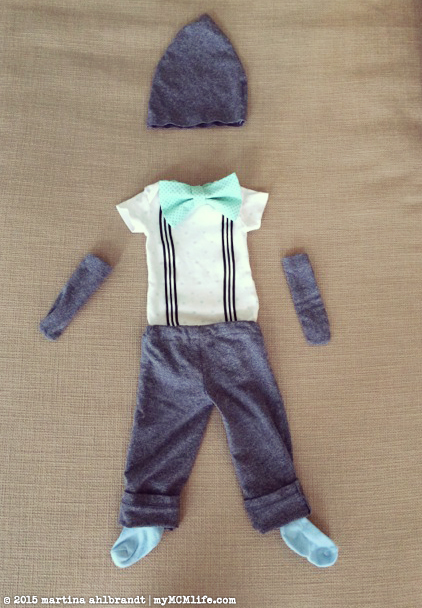 The onesie and little blue socks are the only pieces I didn’t make. 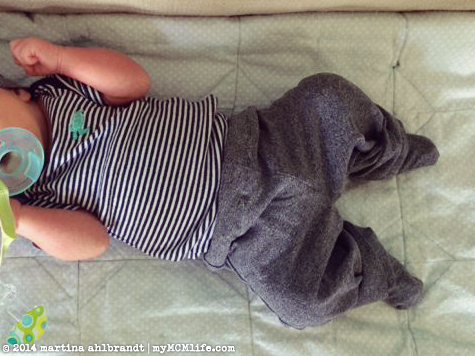 Nothing inspires me to sew more than a new baby! Next up is a baby blanket. 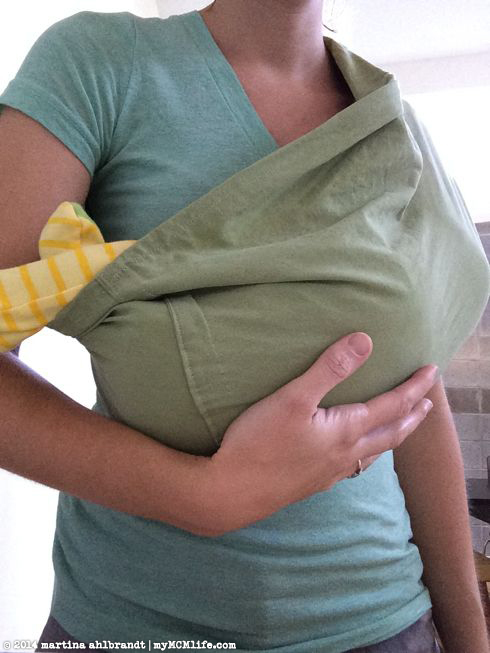 I’ve been storing an olive green sheet for years, planning to sew it into a baby sling. Slings are great for a tiny newborn, which we’ve never had until now. In fact, Firefly is too small for our Infantino baby carrier or Moby wrap (or the ErgoBaby carrier I’m drooling over!). 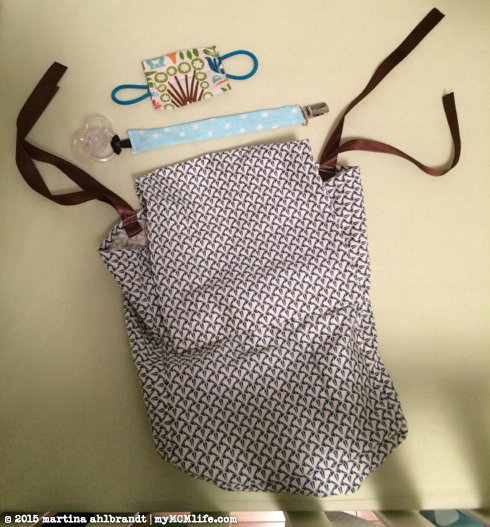 I found this sling tutorial via Pinterest and whipped up a sling for Firefly one Saturday afternoon. It’s perfect for him and I love the color. While I had the sewing machine pulled out, I decided to sew some baby tube socks and mittens for the little guy using upcycled old socks. 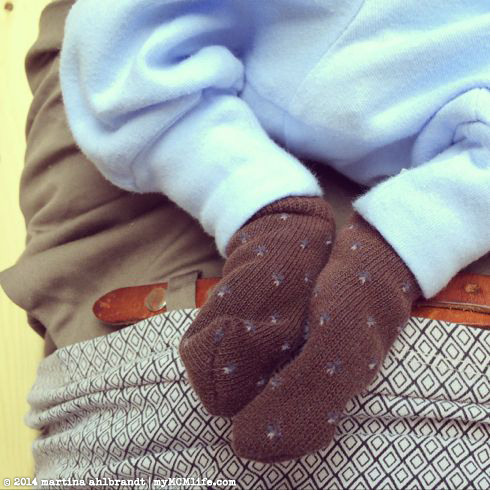 His little hands and feet are so small that baby mittens and socks dangle off of him. 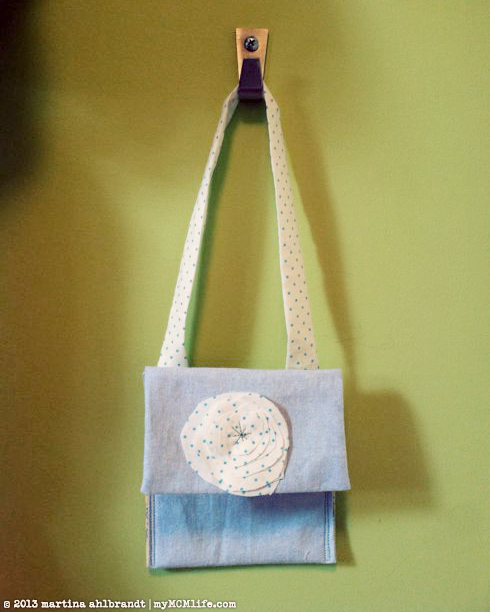 I used this trusty tutorial from Made By Joel, the same one I used 3 years ago for baby Alianna. I spent another afternoon nap time sewing Firefly some baby pants from shirt sleeves. 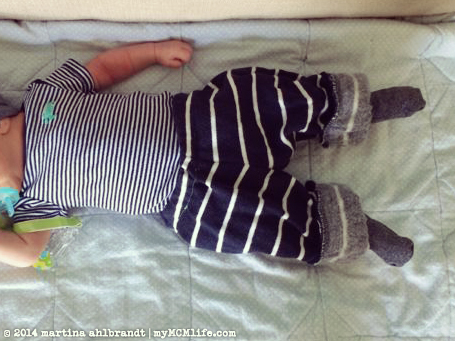 (Just like these upcycled pants like these I made for Ali.) They’re fairly easy and free if you have some old sweaters, sweatshirts or long-sleeve shirts you don’t need anymore. Jason had a striped hoodie that shrank in the wash—so much that it didn’t even fit me. I’ve been hanging onto it for such a time as this. I made Firefly some pants with room to grow since they’re really too warm for summer in Nashville. I also made him some lightweight pants from two gray long-sleeve t-shirts that I was no longer wearing. Since the pants turned out pretty well and I still had a lot of shirt leftover, I made him a hat and a pair of simple tube socks. 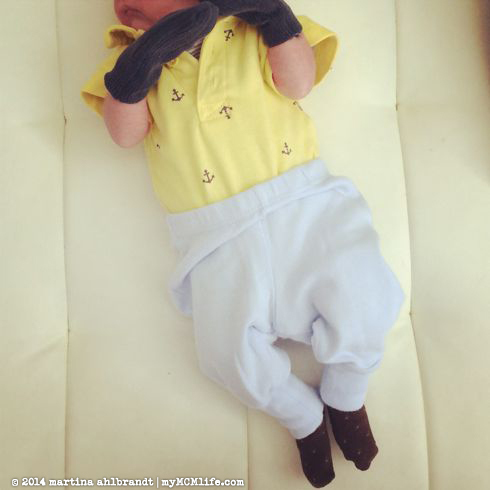 The socks are perfect for his tiny feet but I’m guessing they’ll only fit for a couple weeks until his legs get more chubby. I’m glad I didn’t have to spend a penny on them. Ali has been really into mimicking her mama lately—wanting to put on make-up, glasses—and recently wanting to carry a purse. She had taken to using a red plastic bucket with a handle as a purse and I thought it would be fun to make her a special handbag of her own. Actually, I had been itching to do some sewing ever since I got my work room organized with new cabinets (I guess I should post about that some day!) and this was a great excuse to blow the dust off of my sewing machine. 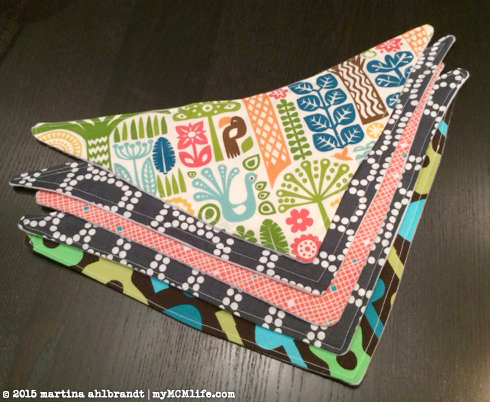 Maybe making a dust cover for my sewing machine should be my next project. I did this quickly during a nap time one afternoon. 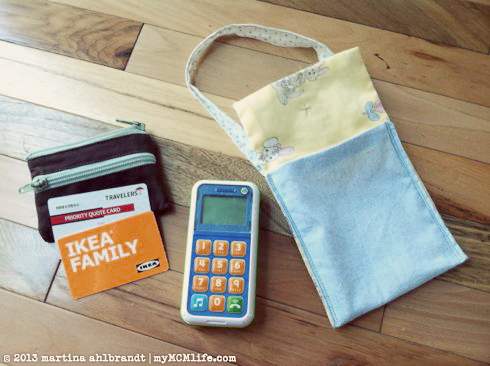 It’s a perfect fit for her Leap Frog cell phone and a small wallet that I no longer use. I added a couple of fake debit cards for her to play with. When I gave her the purse she immediately pulled out the phone to play with and then later discovered the wallet. She pulled it out and said, “What’s this, Mommy?” with a big grin on her face. It’s so fun to surprise our kids, isn’t it? You can see her carrying her purse while we were grocery shopping in yesterday’s blog post. I recently read a post over on one of my favorite blogs of all time about little girls imitating their moms and how important it is that we exemplify the kind of woman we hope they become. Ali is about the same age as Ashley’s youngest and she is definitely watching and learning from everything we do. It’s a good reminder to be very intentional. • First of all, I have no intentions of writing a DIY tutorial on furniture upholstery. It’s hard work, requires a lot of tools and knowledge. This was definitely not a beginner project. We didn’t take a lot of pictures during the process of reupholstering the sofa, just pictures of the deconstruction for our own reference and progress shots to make ourselves feel better after some long nights of work. If you want a DIY, check out this chair reupholstery blog post that I saw on a friend’s Pinterest page. There are also lots of videos on YouTube and many more tutorials out there. We started out watching videos, getting 4 books from the library, ordering tools, and studying other pieces of furniture. For my birthday back in June, I got a staple gun from my dear husband and The Complete Guide to Upholstery from my mom, both of which have been used a lot. I also found this Great Neck tack puller to be invaluable for removing staples during the deconstruction. • Sewing skills are crucial, especially for making cushions and doing piping. Thankfully, I have been sewing since middle school and I have my Granny’s old trusty Singer. I sewed approximately 600″ of piping! • Reupholster with a buddy. I cannot imagine doing this solo. Working with Jason made it so much easier to move the pieces of the sectional around from room to room, inside to outside, flipped over and back up. Usually I was stretching and positioning fabric while he was stapling. Or I was sewing while he was cutting the pieces out of the upholstery. Plus, it’s nice to have someone else to problem-solve with. • Experience is the best teacher. Jason and I reupholstered four chairs before we decided to tackle this sectional. Chair 1. Chair 2. Chairs 3 & 4. Each project we’ve done has gotten progressively better. If we were to do this same sofa over again, I’m sure it would be much better the second time around. • A few people have asked me how hard it is to upholster a sofa. Difficulty is relative. We didn’t find it difficult. In fact, my [obnoxiously optimistic] husband said on our first night of working on the sectional, as we were deconstructing each piece and figuring out how it was constructed: “Honey! This is going to be easy!” I just laughed because that could not be more opposite of what was going through my mind. But I clung to that statement, hours, days, weeks into this project. It really wasn’t hard. It was time consuming. No joke, I’m pretty sure this took between 40-50 hours of labor with two people… that’s about 90 hours of work. I’m sure we could do another sectional just like this in 60 hours next time, or maybe less. But I did try to keep track of time for our own reference. We spent an average of 4.5 hours per night working on this, and approximately 10-12 nights over 3 weeks. • Upholstery work is painful! I have more mystery bruises on my legs than I care to count. I have a gouge in one of my legs, two scraped knuckles and tender finger tips from accidental pin stabs. Jason, my professional guitarist, über careful (I call him “Safety Dad”) husband stapled into one of his fingertips. It was bloody and gross but thankfully a picking finger and it healed pretty quickly. My back and arms got quite a workout, too. I think my arms are the strongest they’ve ever been right now. It’s good exercise. See, I can be optimistic, too! OK, enough about disclaimers and what we learned. It was worth it! We have a brand new couch. Sort of. Actually, it’s a 1960 Harmony House for Sears, Roebuck & Co. But it’s like new with brand new foam cushions and new upholstery. I can’t wait to see this piece in our new living room. Recently, I was shown how to turn a pair of looser fitting jeans (flared, bootcut, straight leg, wide leg, etc.) into skinny jeans with a simple technique. I decided I’d give it a shot and combine that with the hemming technique I’ve done once before for shortening a pair of jeans. I’ve had these jeans for years. They’re bootcut and too long. I have hardly worn them because I always felt like they were a little boyish fitting, even if I cuffed the bottoms. The waist and hips fit fine—I have a feeling that’s key in this technique working well. To start out making my loose jeans fit like skinny jeans, I laid out a pair of jeans that fit well on top of the inside-out ill fitting jeans. The pair on top are actually a little too short but that doesn’t matter at this point. I lined up the inner leg seams and the crotches. Then, I pinned along the outside edge of the template pair. The goal is to gradually meet the existing side seam of the loose jeans. This can even happen at the base of the pocket, as long as the rivet still shows. Once both side seams were pinned, I was ready to sew along my pin line. I didn’t take a picture of the sewing. You can imagine what that looked like. Just a simple straight stitch up the pinned line. I decided to sew a second stitch to give the new seam a little extra reinforcement. Cutting off the excess material is optional, though it makes for less bulk inside the pant legs. I left my edges unfinished where I cut and I don’t have a surge machine. That’s another benefit to having two stitched seams, in case the denim frays back after being washed several times. Time to try them on! They were still way too long at this point so it was hard to tell if the fit was better. 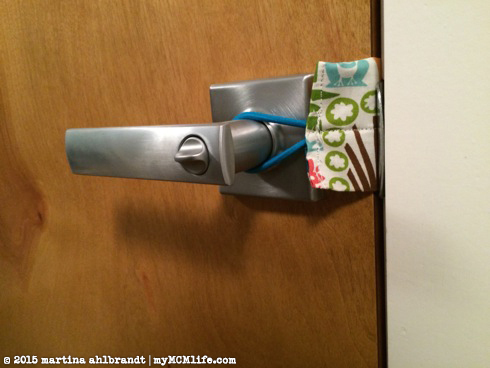 Cuffing is no longer an option because of the extra material or unfinished edges. I folded up one pant leg to the length I wanted (my left leg). See the difference? The right leg is about 2″ too long. The length is a personal preference. I like for the back of the pant leg to just barely touch the ground when I’m wearing a pair of flats. If you where heels a lot, longer is probably necessary. There is a neat trick to hem a pair of jeans while maintaining the original stitching at the bottom of the leg. The extra material was folded upwards, inside the pant leg. Then, I stitched around the fold, as close to the edge as possible but making sure the tan threads of the original hem are still visible. 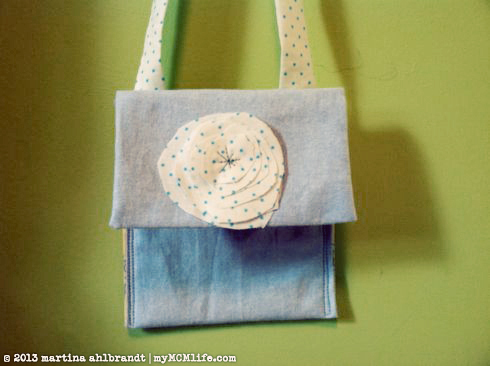 I used light blue thread because it was already in my sewing machine. A little darker blue would have been even less noticeable. Close up it looks a little strange but after ironing the seam and once they’re on, it’s almost impossible to tell they’ve been hemmed. It’s a subtle change (made even more subtle by my poor DIY bathroom mirror photography…) but I feel like I got a whole new pair of jeans for free.